Preach|! 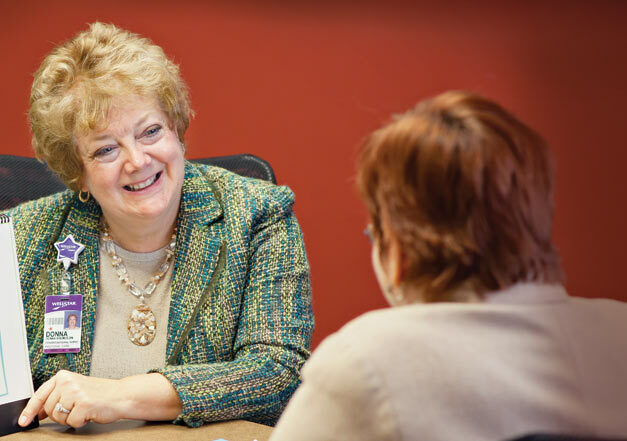 !| Teach and Heal: Donna Kremer heads the Congregational Health Network for WellStar Health System. It’s always a little awkward for Paul Hinchey when they grab his wrist and pump his hand and tell him how much they appreciate the care. Then they’re gone, whole families out the door, stitched and mended, to home or to work. Probably to work. “I’ve seen the people at the Good Samaritan Clinic, probably 95 percent of them are working, and maybe the husband got cut on the job, and it’s starting to get infected, so we treat him and he goes right back to work,” says Hinchey, president and CEO of St. Joseph’s/Candler (SJ/C), the two-hospital healthcare system in Savannah that operates the clinic, which treats an uninsured, mostly Latino population. Around the country, mostly in cities, are countless (but never enough) “Good Samaritan Clin-ics,” delivering care to underserved populations. Most are operated by hospitals, and these clinics are among the clearest examples of “community benefits,” which encapsulate a variety of uncompensated services, such as indigent care or charity care, research, education and so forth. And while not-for-profit hospitals are required to provide these benefits to maintain tax-exempt status, the value of dollars contributed usually far outweighs the value of their tax-exempt status. “It’s part of a hospital’s vision and mission statement, this commitment to community service,” says Joyce Reid, vice president of community health connections for the Georgia Hospital As-sociation (GHA). According to GHA’s 2011 Community Benefits Report, Georgia’s not-for-profit hospitals spend $983 million a year on these services – and it could be closer to $1 billion by now, because the report is based on 2009 figures. This is the third year GHA has released the report – the timing coincides with new, additional community benefit requirements for tax-exempt hospitals, as dictated first by the Internal Rev-enue Service (2009), then by the Patient Protection and Afford-able Care Act, signed into law by President Obama in March 2010. This month, Georgia Trend looks at some of the community benefit programs offered by not-for-profit hospitals and health systems around the state. They have one 24-hour staffed ambulance at tiny Louis Smith Memorial Hospital (25 beds) in Lakeland, and it makes about 1,200 transports a year, often beyond Lanier County lines, to other, usually larger hospitals that might be better equipped to deal with the biggest emergencies. Which means, if you got hurt or had a medical emergency in Lanier County while that one ambulance was out on a call, you could be in trouble. With EMS Director Randy Patten taking the lead and support from citizens, local leaders and state agencies, they provided free training for at least 30 public servants as Emergency Medical Responders (EMRs) and more than 100 citizens in CPR. This small force of volunteer emergency personnel can provide care while awaiting EMS assistance from the local service or remote counties. Louis Smith Memorial (an affiliate of South Georgia Medical Center in Valdosta) recently made the GHA’s Circle of Excellence, the first Critical Access Hospital (i.e., small and rural and limited) to achieve the honor. It’s for all the awards in patient safety over the past few years, including both the emergency medical training and creation of a chronic disease registry. The registry targets patients with diabetes and cardiovascular diseases, providing education and medical oversight, and preventing visits to the emergency room. “The point is, you can’t treat chronic disease in a 15-minute office visit. Chronic disease requires extended case management,” Wilson says. That’s where Kristen Ley comes in. An RN who is training to become a nurse practitioner, Ley meets regularly with patients enrolled in the registry. It’s all free. “My job is to help the patients manage their condition, to teach them how to take responsibility for their disease, whether it’s monitoring their blood sugars, finding assistance programs to help them afford medication or just understanding the literature,” says Ley. They are also registering patients in neighboring Echols County, working with a clinic for migrant farm workers there. “Our objectives are to improve quality of life and keep people out of the emergency room,” Wilson says. They call them “community” benefits for a reason, in other words. And it takes community partnerships to get the most benefit. Sometimes, lots of partnerships. Take Satilla Regional Medical Center’s (SRMC) annual Camp Huff-n-Puff. Always held during the first week of May, it is geared toward children ages 5-12 who are asthma patients, and their parents. This one-night event, which is basically a lot of education disguised as fun, is a collaboration among SRMC, Southeast Health District Children’s Medical Services, Okefenokee Technical College, Second Baptist Church, Shuman Healthcare, Ware Children’s Initiative, Ware County School Nurse Program and Way-cross Bank and Trust. When Donna Kremer speaks of her partners, she’s talking about 94 of them, at last count – churches, temples, worship centers, at least one synagogue. Kremer runs the Congre-gational Health Network for the Cobb County-based WellStar Health System. WellStar’s faith community partners are African-American Episcopalians, Buddhists, Bahá’í, Catholic, Greek Orthodox, United Methodist, Seventh Day Adventist, Southern Baptist, Jewish. “I can keep going if you like,” Kremer says, making her point – a bunch of different religions. Congregational Nursing, also known as parish nursing and faith community nursing, is recognized as a specialty practice by the American Nurses Association. Kremer describes the practice as “taking faith and health and integrating them together in a basic way to care for the spirit as well as the body and the mind. So it’s basically preach, teach and heal. Churches find WellStar. That’s how the program grows. Most of the time it’s a nurse, someone from, say, the Unitarian Church. Or it’s a faith leader, or someone from the laity whose sister heard about health ministries. They contact Kremer, who is an RN with a seminary education. Then, the way it works is, each congregation defines and directs its own ministry (or network, or what have you). The congregational nurse/health leader serves as a volunteer coordinator, assembling the teams that assist with health ministry/network programs, such as health fairs, blood pressure screenings and the like. And WellStar provides the referrals and resources (including speakers), for programs about heart health, breast cancer awareness, CPR instruction, diabetes education and senior citizens programs, among other things. The widespread network includes congregations in Bartow, Cherokee, Cobb, Douglas, Fannin, Fulton, Paulding and Un-ion counties. In 2006 WellStar was approached by Dr. Janice Long, who was running Kennesaw State’s Project IDEAL (Initiative for Diabetes Education Advancement for Latinos). She was looking for ideas to sustain the program, which was reaching the end of a grant cycle. Kremer, who was at that table, saw a clear solution. Using tools developed by WellStar, Project IDEAL, and the Centers for Disease Control and Prevention (CDC), they trained several promotoras – the first class was all women. When the pilot church held a health fair, with screenings, the most at-risk participants were personally contacted by a promotora. The promotoras conducted an education and monitoring program that has led to healthy behavioral changes and fewer emergency room visits, and what started as three promotoras in one church had become 26 promotores in five churches as of February 2012. There are a couple of recurring themes in the background of many community benefit programs: keeping people out of the ER and treating the outsider, however that is defined – the proverbial underserved, an uninsured immigrant migrant worker or, in the case of Southeast Georgia Health System in Brunswick, international merchant seafarers. They’re basically migrant workers who spend weeks and months at sea, often working in unsanitary conditions, subsisting on poor diets on ships with minimal medical care. “It’s very physical, sometimes very dangerous work, because these people actually work inside a large floating machine, because that’s what a commercial merchant vessel is, a big industrial machine,” says Robert Randall, director of volunteer services at the International Seafarers’ Center. Established in 1982, the nonprofit Seafarers’ Center provides a variety of services to support merchant mariners while their ships are docked at the Port of Brunswick, such as chaplain services, counseling, transportation, email, food. And access to health care. Toward that end, Southeast Georgia started partnering with the center in 2003. “Something like 70 different nations come into our port throughout the year, and occasionally these people have issues, medical problems or dental problems,” says Charlie Ratcliffe, an RN who serves as the health system’s nurse educator and liaison with the seafarers’ program. In addition to the expedited emergency care for sick or injured sailors, the health system provides free preventive health screenings, utilizing nursing students from nearby College of Coastal Georgia. The program won a GHA community leadership award several years ago. A person who spends most of his time on the streets of Savannah gets sick. He hops on a bus, or someone drops him off at the nearest emergency room. So they did the proactive thing. They did a community needs assessment – which hospitals are supposed to do anyway – but they conducted the assessment and started budgeting for community benefits as if they were CT scanners or some other medical necessity. They paid particular attention to the Cuyler-Brownsville neighborhood, a historically African-American (and disenfranchised) community in the city. That’s where they opened the St. Mary’s Community Center, in a 100-year-old building, formerly a school for African-American children. “We went from passive to proactive, that was one thing. The other thing is, we looked at a broader definition of what makes good health,” Hinchey says. “It’s access to healthcare, and it’s a decent job, it might be affordable housing – if you live in substandard housing and nobody ever comes in to change the filters. The community center has workforce development programs and adult education classes, programs in financial literacy, free tax preparation, after-school, preschool and summer camp programs for kids. There’s a food bank, supplied in part by local farmers. Next door to the center they’ve redeveloped an old school and hospital building and created 88 affordable housing units. Of course, there is healthcare, too – St. Mary’s Health Center grew out of the community center. It is staffed by nurse practitioners, RNs and other health workers who provide non-emergency, primary care services, health screenings, women’s services; there’s an X-ray unit and a lab, and it’s free. Hinchey says SJ/C spends about $3.3 million a year on three major community benefit programs – the Good Samaritan Clinic, the St. Mary’s Community Center and the African American Health Information and Resource Center (AAHIRC), where they have a media center, computer classes, Internet access, housing information, help with small business loans, a women’s fitness club and more. It’s all part of that broader definition of good health. A sampling of hospitals and health systems spotlighted in the Georgia Hospital Association’s 2011 Community Benefits Report. Hamilton Health Care System (Dalton) – Dare to C.A.R.E. : A two-part comprehensive cardiovascular disease program focusing on early detection and education offered quarterly. Tift Regional Medical Center (Tifton) – Kickoff to Men’s Health: An annual event that provides free medical screenings and a complimentary brunch. Grady Health System (Atlanta) – Blood and Glucose Screenings: Free screenings at an annual health fair hosted by Congressman David Scott and at the Atlanta Diabetes Expo. St. Mary’s Healthcare System (Athens) – Swagger, Inc. – Helmet Safety Program: As part of the program, teams of racers and neuroscience nurses travel to schools in St. Mary’s service area to encourage bicycling safety and helmet use. The program provides free bicycle helmets for students who cannot afford them. West Georgia Health (LaGrange) – Sports Physicals: Sixty physicians, along with scores of nurses, physical therapists and other medical professionals, provide free athletic physicals to middle- and high-school students. Gwinnett Medical Center (Lawrenceville, Duluth) – ImPACT™ Concussion Program: The ImPACT™ (Immediate Post-concussion Assessment and Cognitive Testing) Concussion Program is a 20-minute computer-based neurocognitive test battery developed to scientifically measure the effects of a sports-related concussion on student athletes. Piedmont Newnan Hospital (Newnan) – Explorer Program: Piedmont Newnan Hospital partners with the Central Educational Center and the local Boy Scouts of America Council to provide a program that helps Coweta County’s youth prepare for careers in healthcare. Shepherd Center (Atlanta) – Therapeutic Recreation: This type of care helps brain and spinal cord injury patients find ways to do things they used to enjoy. For the complete report, including a rundown of all the spotlighted hospitals, visit https://publications.gha.org.